Here are some cereal coupons that are still available to print. 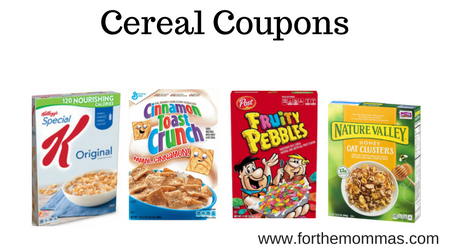 You can save up to $18.00 with these cereal coupons on brands like General Mills, Kellogg’s, Post, One Degree & More. Save $5.00 when you spend $30.00 on any Kellogg’s® Cereals or Pop-Tarts® toaster pastries. Save $1.00 when you buy TWO (2) BOXES any flavor General Mills cereal listed: Cheerios™, Cinnamon Toast Crunch™, Lucky Charms™, Reese’s Puffs, Chex™, Blasted Shreds™, Cocoa Puffs™, Trix™, Cookie Crisp™, Golden Grahams™, Kix™, Fiber One™, Wheaties™, Raisin Nut Bran, Total™, Basic 4™, Oatmeal Crisp™, Nature Valley™ boxed cereal, or Nature Valley™ Granola.